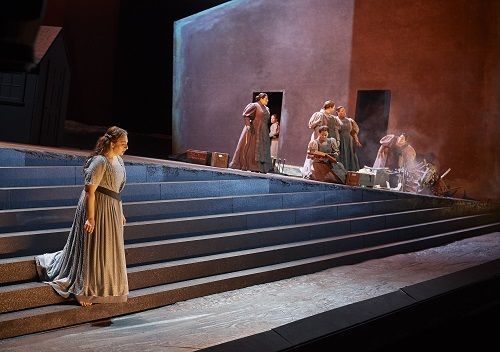 I was excited to see Christine Goerke, Brünnhilde of Canadian Opera Company’s most recent mount of the Ring Cycle operas, return to the COC stage as Richard Strauss’ Elektra in the 2019 production on stage until February 22. Directed by James Robinson, the production is a stylistically updated remount of a production developed by the late Richard Bradshaw in 1997. It is based on the tragedy of the same name by Sophocles. Elektra has been driven to the brink of madness trying to find a way to avenge the murder of her father, Agamemnon. Agamemnon was savagely murdered by Elektra’s mother Klytämnestra, and her mother’s lover Aegisth. Fearing retribution, Klytämnestra and Aegisth have been breaking Elektra’s will with physical and emotional abuse. Her sister, Chrysothemis is trying to convince her to play it smart, accept Klytämnestra and Aegisth’s ill-gotten rule and focus on the proper interests of a woman as she has. Their brother Orest is in exile to ensure he cannot exact vengeance on his mother and her lover. To say the family dynamic is dysfunctional is a massive understatement. This fast and furious one-act work is a tour of the human psyche. As the family drama unfolds, we are simultaneously witnessing an archetypal battle between base desire and moral ideals. Notwithstanding the towering, slanted set designed by Derek McLane, the performers do not have a lot of window dressing to illuminate the straightforwardly bleak tale. It can almost be described as an anti-spectacle, where the focus is exclusively on the very human emotional reactions to a legendary situation. In the absence of a lot of theatrical bells and whistles, we maintain a razor sharp focus on the rich expressiveness of Goerke’s epic full-lyric soprano voice and the charisma of her body language and stage presence. Truly one of the most glittering stars of opera today. Goerke’s dark, unstable luster as Elektra is deliciously contrasted by Erin Wall in the role of Chrysothemis. The two women have processed the same situation in very different ways with Wall’s character embracing the deceptively simple philosophy “it is what it is”. This day-night dynamic showed in their interpretation of Strauss’ tempestuous and unrelentingly dark score. Wall’s voice is weighty, as is necessary for the dense score, and yet brought an unburdened brightness to this complex role. I also greatly enjoyed the cold steely rigidity of dramatic soprano Susan Bullock in the role of Klytämnestra. The evil queen has no maternal instincts and no remorse, focused only on avoiding the retribution of her children. She is well matched with lyric tenor Michael Schade as a smug, smarmy Aegisth. Bass Wilhelm Schwinghammer was single-minded, righteous self-confidence personified as Orest, the deposed son of King Agamemnon. I wonder if I’m the only person who found the performance reminiscent of an operatic Javier Bardem in No Country for Old Men? Musically, this work is a testament to Richard Strauss’ emotional and dramatic range, a far cry from his Flower Songs I sang in grad school. This work is a frenzied maelstrom of subtle and not-so-subtle harmonic dissonances and jagged melodies wherein the lyricism seems almost accidental. Almost, but not quite. Definitely worth seeing this masterpiece interpreted by a world-class cast led by the spectacular Christine Goerke while it is on stage in Toronto. Show times are 7:30 PM on February 6, 12 & 22 with additional matinees at 2:00 PM on February 10 and 4:30 PM on February . Previous PostReview: SKOW (Citadel + Compagnie)Next PostPlaylistings for the Week of February 4th, 2019. The orchestra drowns out the singers. I was in row J, only 10 rows from the stage. I rarely heard the singers. At one point the surtitles say the tenor sings, as he wants help while being murdered “Can anybody hear me?” The answer is no, only the orchestra can be heard. Elektra sings (according to the surtitles) “Be silent. Let’s dance.” The orchestra takes “Be silent” as a challenge to be loud. This is frustrating because opera is about singing. Also the COC will not refund ticket because the orchestra blots out the singers. The conductor does not know an opera orchestra is to accompany the singers, not compete with them.